A six-session audio training course in India’s time-tested "science of life." The most enduring science of healing is founded on the principle of achieving balance between our body, mind, spirit, and environment. This science is called Ayurveda—a comprehensive approach to health and wellness that has been refined for 5,000 years. 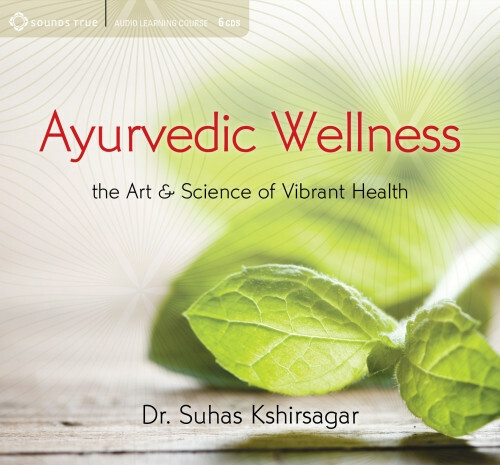 With Ayurvedic Wellness, Dr. Suhas Kshirsagar presents an in-depth audio training program in the principles and practices of the "science of life." In this six-session course, Dr. Kshirsagar offers practical instruction in cornerstone principles of Ayurveda—including diet, exercise, breathing, and meditation—to balance, heal, and transform your life. Ayurveda recognizes our lives as an integral whole, in which mind, body, and spirit are in constant communication. Dr. Kshirsagar teaches you the foundational tools of self-awareness to deepen your understanding of how every experience and decision in your life impacts your overall health. As you progress, surprising connections will emerge—you may suddenly recognize a link between your sleep habits and mood, discover how music affects your digestion, or reveal the emotional source behind unhealthy food cravings. Ayurveda gives you the means to clarify your personal health needs and create a wellness plan that is right for you. "In Ayurveda, well-being stems from awareness of one's own mind and body," teaches Dr. Kshirsagar. Now you can learn the key principles of this life-changing science for health, happiness, and self-discovery with Ayurvedic Wellness.